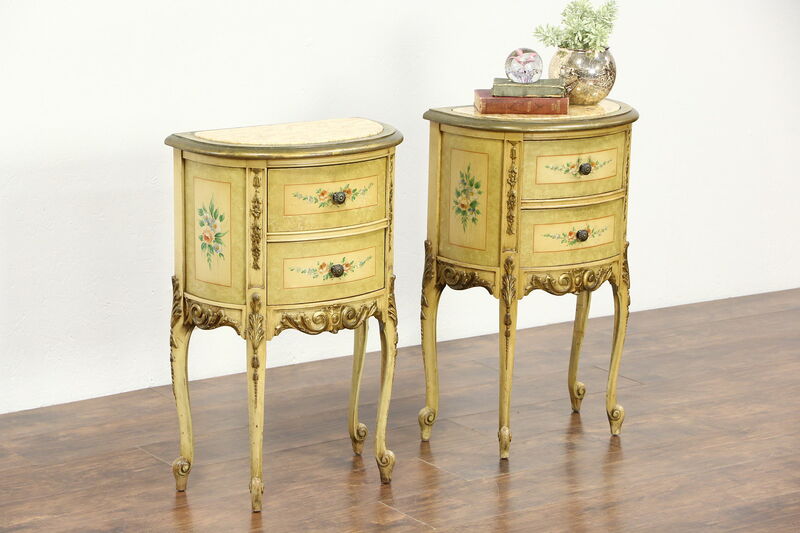 An elegant pair of nightstands or end tables were hand painted in the French manner about 1930. Painting and dark gold accents have distressing plus some wear for a little antique character, see photos. The original finish is preserved with clear varnish on this gracefully curved pair. One of the original marble tops has a professional restoration, both have been polished and sealed to resist stains. Drawers have curved fronts and solid oak sides with dovetailed joints. Knobs are original on this American made vintage furniture. Dimensions are 19" wide, 11" deep and 29" tall.